A genuine "Chrome" Tourmaline that has been tested for Chromium using a Chelsea filter. Unlike ordinary green Tourmaline, Chrome Dravite, also known as Chrome Tourmaline goes a distinct orange, showing the Cr rather than Fe content. The reason these gems are more sought after than their regular counterparts is the depth of colour they possess. An eye clean gem with a green hue and a slight yellow tone. The colour is nice and strong, plus the gem has been cut to keep the color level in the right range, so it doesn't look overly dark. All my gems come with a small gift. It is just a little fun to go with your purchase. To make it interesting for those who want the challenge of identifying the gem themselves, the gem id is in a closed slip..
1.81ct Tourmaline. A baguette cut, loose gemstone with a forest green colour. A strongly coloured gemstone with no color zoning. Forest green with undertones of brown, it is eye clean with just some minor surface imperfections. 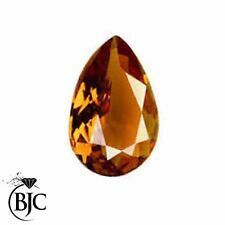 Although 1.81 carats it gives the impression of a substantial gemstone. All my gems come with a small gift. It is just a little fun to go with your purchase. To make it interesting for those who want the challenge of identifying the gem themselves, the gem id is in a closed slip..
PARAIBA TOURMALINE COPPER BEARING. VVS.100%NATURAL.BLUISH/GREEN.RARE GEMSTONE!! It's a Parabia Tourmaline. VVS Nearly a CT. From Brazil. Now this Gem is not a Carat. But it's Clarity makes up for it's size. Because of there rarity these Gems are one of, if not most sought after gems in the World! A genuinely stunning stone: it is eye clean with an excellent cut and outstanding surface polish. The stone is bi-colour, split 50/50 between Indicolite (blue Tourmaline) and Verdelite (green Tourmaline). The colours graduate into each other, giving an effect that would be best described as that of a Peacock's plumage. Due to the value of the gemstone and to give a solid reassurance to any potential buyers, I have had the gem certified by the AIGS laboratory. The gem will be supplied with the report card, which can also be viewed online at the AIGS website. The online report card reference is: GB17083108. All my gems come with a small gift. It is just a little fun to go with your purchase. A fully coloured Watermelon Tourmaline. Colour is primarily pink but there are clearly demarcated sections of white and green at one end. The gem has been cut from a thin crystal hence the long thin shape. This is quite a delicate beauty and will look truly stunning either in a collection or a handmade piece of jewellery. All my gems come with a small gift. It is just a little fun to go with your purchase. 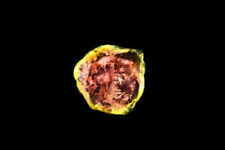 To make it interesting for those who want the challenge of identifying the gem themselves, the gem id is in a closed slip..
A stunning, eye clean Tourmaline in a fiery yellow hue. The cut is an excellent cushion, for this top gemstone. The colour is really well saturated and the gem has been cut to keep the color level in the right range: a perfect balance between light and dark. All my gems come with a small gift. It is just a little fun to go with your purchase. To make it interesting for those who want the challenge of identifying the gem themselves, the gem id is in a closed slip.. 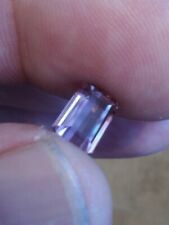 Type Natural Bi Color Tourmaline. Weight 0.42 Cts. Type Natural Tourmaline. Weight 1.19 Cts. Color Green. Shape Cushion. Type Natural Pink Tourmaline. Weight 1.02 Cts. Clarity VS ( /- ). Color Pink. For sale is this: ***Rare GIA Certified Golden Yellow Tourmaline Bi-Colour Octagonal Cut 1.43ct** Beautiful Natural Colour, although GIA state yellow, it can clearly be seen as a natural bi-colour Pink-yellow gemstone. Weight 1.43ct Measures: 8.71 x 5.14 x 3.85 mm Shape: Octagonal. Cutting Style: Step Cut. Transparency: Transparent (VVS) Colour: Yellow Species: Tourmaline. Certified by GIA (Certificate included). ANY QUESTIONS PLEASE ASK BEFORE PURCHASING. Please view all pictures as these form part of the description. GEM TYPE: Tourmaline. Natural earth mined gemstone. WEIGHT: 2.05ct. HARDNESS: 7-7.5. Cut in dark moss green nigerian natural tourmaline. This is not the highest quality tourmaline hence the low price. However the cut is certainly to at least my usual standard. The stone is eye clean and large enough to form the centrepeice of a pendant. Here is a nice little natural green Tourmaline, untreated. Clarity is Eye Clean and faceting is very good. A nice quality little Tourmaline. Combining is available at 20p per other item. Type Natural Pink Tourmaline. Weight 0.90 Cts. Clarity VS ( /- ). Color Pink. Type Natural Tourmaline. Weight 0.77 Cts. Color Green. Category : Semi - Precious. Origin: Srilanka. Rough: Rubellite Tourmaline. 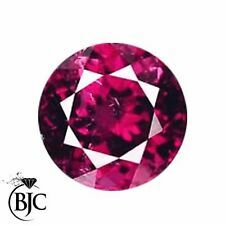 Deep, rich purple pink in this nice piece of Rubellite Tour. Origin: Nigeria. Scale is in mm. Clarity Scale. I: Included. A: 70% clean and above. AA: 80% clean and above. 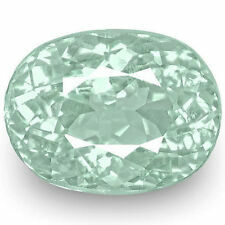 0.45 ct Eye-opening Pear Cut (6 x 5 mm) Copper Bearing Paraiba Tourmaline Natural Loose Gemstone. Paraiba Tourmaline. Slices of this stone should have a green rind with a pink center. There are currently 10 different varieties in the tourmaline family. Size : 6x5mm or 5x6mm. Green Tourmaline Rectangle 1.20ct VS. This is Green Tourmaline (superb forest green). The gemstone is clean.This natural gem has not been treated. It is a loose faceted gem. Cut : Rectangle (step cut). Deep Pink Tourmaline Rubelite Oval VS Loose Natural Gemstone Afghanistan. Size : Exact Size 9x6.6mm (Can be used in 9x7mm or 7x9mm setting ). Origin : Afghanistan. 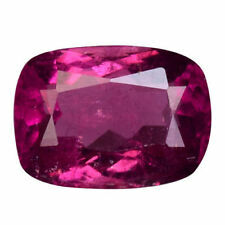 This is a fine quality Pink and Red Tourmaline. Oval Shape 1.27 Carat Light Pink Tourmaline. Loose Stone. Size mm: 6 x 5 mm. 3.5 mm Depth. Size : exact size 17.65x6.77mm (can be used as 18x7mm). It is best quality afghan tourmaline with beautiful light green on one side and light pink on the other. It has a surface line fracture (seen as a tiny silver line) on the pavilion facet. Size : 5.5x7mm or 7x5.5mm. This is a Green Tourmaline gem. It is cut from from best color and quality afghan tourmaline crystals.It is loose faceted gem. It is eye clean. It is natural gemstone and is not treated. Size : 7x6mm or 6x7mm. This is sparkling Light Pink Tourmaline (Rubelite). Origin : Afghanistan. This natural gem has not been treated. It is a loose gem. Clarity : SI. Color : Light Pink. I: Inclusions are very prominent to the naked eye and to the point where transparency of stone is affected. Beautiful Multi tourmaline 8x6 mm oval cut loose gemstone for Jewelry making.A Set of 5 pieces and fine luster with & color.total weight is 6.58 carat for All.Perfect material for making color full jewelry. Size : 5x8mm or 8x5mm. This is a Green Tourmaline gem. It is cut from from high quality afghan tourmaline crystals.It is loose faceted gem. It is eye clean. It is natural gemstone and is not treated. Blue Indicolite Faceted Gemstone. This is a Blue Green Color Tourmaline which is categorized as Indicolite due to its blue hue compared to green Tourmalines. Origin : Afghanistan. This is a natural gemstone and is not treated. Size : 6x6mm. Beautiful Natural Blue Indicolite Faceted Gemstone. This is a good Blue Color Indicolite Tourmaline. It has very nice cut. Origin : Afghanistan. This is a natural gemstone and is not treated. Beautiful Faceted Pear Shape. Pink Tourmaline. Loose Stone. Make your own Jewellery. SHAPE / CUT: MARQUISE CUT. WEIGHT: 0.70 CTS. Total Weight & Size may vary Slightly. Colors may seem different due to computer Display variation. SIZE APPROX: 10 X 5 X 2.1 MM ORIGIN: AFRICA. Clarity Scale. Shape: Oval. Color: Pink. Origin : Mozambique. Gem: Golden Green Dravite Tourmaline. Cut: Trillion. Big and beautifully cut, rare, golden green gem here that is unique in its colour, clarity and size. Magnificent for a drop pendent and smoulders with character and internal fire. This is a Green Tourmaline gem from best colour and quality afghan tourmaline crystals.It is loose faceted gem. It is eye clean. These are natural gemstones and are not treated. Indicolite Tourmaline Oval 1.19ct VS Afghan. Nice Ver Dark Green Colour. Oval Shape 2.54 Carat. Cut & Polished Tourmaline. Loose Stone. Condition: In Good Condition. New, Never Used. Colour Bluish Green. Weight 0.63 CT. Shape Pear Cut. Flawless Very Very Slightly Inclusion Very Slightly Inclusion Slightly Inclusion Open Inclusion Opaque. Size 7.40x4.90x2.70 mm. Size : 5x6mm or 6x5mm. This is Light Green Tourmaline. The faceted gemstone is clean.This natural gem has not been treated. It is a loose gem. Origin : Afghanistan. Clarity : VS. VS: Inclusions are very small that are not easily visible to the naked eye. This is a Green Tourmaline gem is cut from from best colour and quality afghan tourmaline crystals.It is loose faceted gem. It is eye clean. These are natural gemstones and are not treated. Indicolite Tourmaline Oval 1.42ct VS Afghan.